Pop-Up is a parking garage by Denmark’s Third Nature that rises in the city scape as its base absorbs rainwater overflow. Boston — On May 17, BSA Space will launch NatureStructure, an exhibition exploring a new generation of nature-centric projects designed to support nature and employ natural processes. 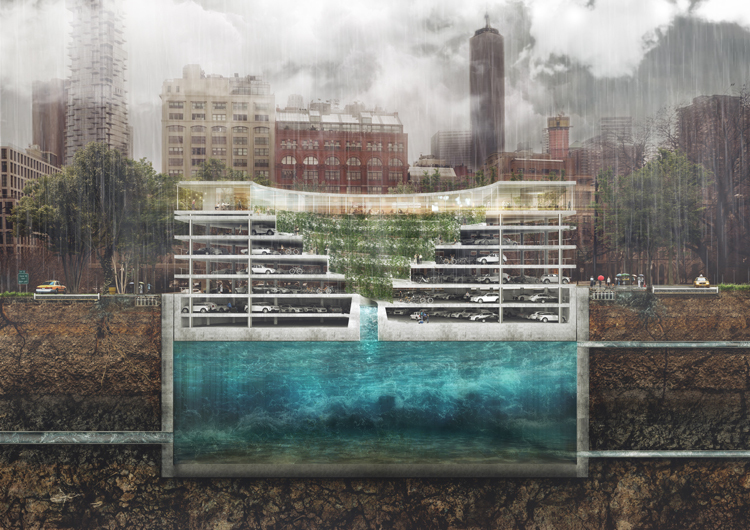 NatureStructure will show how man-made structures and systems can support and work with nature to create resilient and sustainable cities and regions as well as repair and restore ecosystems damaged by development and human activity. Curated by Scott Burnham, NatureStructure will feature a vast array of international projects that weave built projects with nature and natural functions to enable cities and regions to function as living systems. In Geneva, a bridge contains tubes of algae to consume the CO2 produced by cars on its motorways. In Rotterdam, a playground is engineered to contain and disperse vast amounts of water during cloud bursts. In Singapore, tiles have been designed for the sheer rock walls separating the city from the ocean to restore the aquatic ecosystem lost during the city’s rapid growth. 3D printed reefs and seawalls by Australia’s Reef Design Lab are designed to repopulate Sydney Harbor sea life and counter the depletion of reefs in the world’s oceans. “The BSA Foundation is excited to host this exhibition, which offers examples of how fostering the possibilities that dwell at the intersection of the built and natural environments can elevate the lives of urban dwellers,” says Laura Wernick FAIA, BSA Foundation chair. Works exhibited in NatureStructure will include the U.S. premiere of the Delfland Sand Motor, a feat of engineering that uses coastal tides to distribute sand along the coast of the Netherlands to reverse erosion and protect against sea level rise; Pop-Up, a revolutionary parking garage by Denmark’s Third Nature that rises in the city scape as its base absorbs rainwater overflow; and 3D printed reefs and seawalls by Australia’s Reef Design Lab to repopulate Sydney Harbor sea life and counter the depletion of reefs in the world’s oceans. The exhibition will be on display at BSA Space through September 23. Admission is free. More information is available at https://www.architects.org/bsaspace/exhibitions/naturestructure.